I am a semi-retired psychotherapist/psychiatric social worker and certified hypnotherapist. Originally a practicing attorney, I changed careers during the 1980's. My interests include history, constitutional law, Hindustani classical music, yoga, meditation and spirituality. Get Out of This Country! The United States of America is now mistrusted and even despised throughout the world. And Mr. Bush and the corporate proto- fascists who now control the US are not the cause but merely a symptom, a reflection of the real cause. And the real cause is the apathetic, corrupt, greedy, self-centered, vacuous, meaningless, consumption-obsessed American population, which has no real values except “money-making” and self-indulgence. A population which put Bush and his minions in office not once but twice- to the amazement and disgust of every nation in the world- has nothing to do but hang its head in shame. But they lack the insight to even experience shame. There is no excuse for nor remedy for the self-centered amorality of so high a percentage of the people of the United States. They are apparently hopeless and beyond redemption. They are personally and fully responsible for the death and destruction of hundreds of thousands of human beings during the course of the criminal War of Blood for Oil that is still raging with their express or implied consent. Not Bush. Not Cheney. Not Rumsfeld. You, Mr. and Mrs. America, who stand in line to buy the latest iPod while children are getting their faces blown off. Stop pretending that you care. You don’t give a goddamn. You have no self-respect or regard for yourselves; so why would you have any genuine regard for anyone else? You’re so obedient, so compliant, so fearful, so “don’t- rock -the-boat.” The corporate advertisers know that; and so do the politicians. They can sell the Americans anything they want to, whether it be a stupid gadget or a self-serving nitwit idea. The sad fact is that an inordinate percentage of Americans are functional morons. That’s why they’ve lost their democracy. That’s why they’re debt-ridden, driven workhorses who have no real human existence at all but are just money-making machines serving their masters in not-so-blissful ignorance. I’m talking about you, Mr. and Mrs. “Respectable” America. You blasted idiots! And if - ever so rarely- you have the slightest doubt about the “American Dream” you’re living, you think there’s something wrong with you and you go out and get a second- or third- job to get back in step. And bankruptcy and foreclosure are always on the way to your door. But you can’t even go bankrupt any more. The corporate politicians you put in office abolished it. Remember? Too bad. Ultimately the people of a nation get the kind of government and the kind of society which they choose or condone. That was true in the Germany of the 30s and 40s and it is true of America today. And don’t flatter yourselves by thinking that nasty comments like this are just meant to wake you up. You’re too ignorant, stupid, self-centered and scared to be awakened. You are hopeless. No need to tell you to go to hell. You’ve been there for so long now. And it’s going to get a lot hotter. I apologize to the new minority of this country; that is, to Americans of intelligence and good will. Perhaps you think I should be more moderate in my views. But I was born in 1942. I was a witness to this country at its high point. Not to say that there weren’t serious flaws. There were. But there is no doubt whatever that Americans as a nation played the major role in literally saving Europe and the world from tyranny and oppression. Americans were loved and respected the world over. But those Americans exist no longer, at least not in any great numbers. They have been replaced by a species of arrogant nitwits whom Senator Gravel recently described as “getting fatter and dumber.” Fat and dumb is the least of it. Just take a look around. Just spend a “normal” day going around our for-profit-only society. Take a look at the new so-called professionals who aren’t really professionals in the true sense at all but just seedy, greedy rug merchants who charge such exorbitant prices for routine services that their clients and patients have to take second jobs or mortgage their homes to pay the bills. Or just consider the rudeness and hostility you have to put up with just to accomplish daily tasks. One of my favorites is the new breed of store clerk, so many of whom don’t have the brains to perform routine jobs efficiently but think they’re “stars.” They affect grand attitudes toward the customers who pay their salaries. They’re nasty and curt and discourteous, apparently viewing themselves as so much better than the jobs they do. Well, I guess it makes sense. If “consumerism” is the new religion in this country then the merchants are the new bishops and priests; and they are entitled to treat their subject worshippers with the same kind of contempt that the Irish clergy manifested for centuries in the old country- until they finally got their asses booted out by a fed-up populace. You see a lot of the same types in medical and other professional offices. They keep you waiting forever at the front desk while they socialize with each other. Then when they finally come over to you they treat you as though you were last week’s un-refrigerated ham salad, usually calling you by your first name so you know they’re your “equal”- or more likely your better. And of course they no doubt deeply resent the money they’re making compared to their employers, who are raking it in to beat the band. If you really want to get a power hit of this kind of crap spend some time in southern California, and particularly Orange County, where “attitude,” rudeness, hostility and inefficiency are standard fare. Not to mention goose-stepping obedience and clone-like conformity. Bush and Cheney’s Ideal State! But the same kind of thing is spreading through the whole country. Then we have the banks and credit-card companies. Even a few decades ago there were “usury laws” and the kind of interest and charges now being routinely imposed on the American public would have been major criminal offenses meriting long prison sentences. Now it’s all just business, thanks to the crooked politicians whose pockets are being so amply filled by the big merchants, their only real constituents. We should not forget that when we speak of “corporatocracy” we are referring to virtual absolute rule by the merchant class, And as the old saying has it: “Where there are merchants there will be deception.” Deception is the least of it. How about perpetual war for profit. I could go on; but what’s the point except to say that this is the kind of “democracy” these American geniuses have allowed to be imposed upon themselves. And they wonder why even our allies aren’t so optimistic about the direction the good old USA is taking. Benjamin Franklin was stopped once in the hallway and congratulated for his work in helping to frame this country’s founding documents. 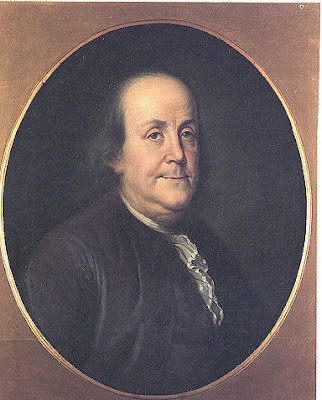 Franklin’s return comment was: “This form of government will work only so long as the American population has not gone corrupt.” Sorry Ben.